The technology division of Williams Formula 1 team, UK-based Williams Advanced Engineering, has published a white paper to showcase its proprietary, patent-pending innovations in carbon composites and the benefits they offer to the automotive industry. PRA takes a look at the groundbreaking technologies: 223 and Racetrak. 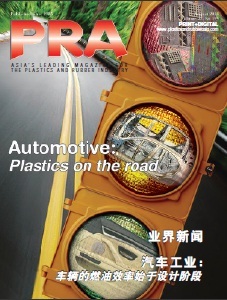 The automotive industry, where lightweighting is key to meeting increasingly stringent fuel economy and emissions targets, as well as support the range required from electric vehicles, has leveraged the advantages of carbon fibre-reinforced polymers (CFRPs). Nonetheless, several factors, including cost, are impeding mass adoption of CFRPs. Traditional composite production methods involve expensive materials and lengthy process times; and they also incur a relatively high scrap rate of around 30%, compounded by the challenges of recovering the carbon from pre-impregnated off-cuts, and of finding value from the material at the end of the product life. These challenges have confined CRFP to niche applications, for instance, a body-in-white structure produced with traditional composite techniques that is 60% lighter than a steel one, yet is around 20 times the cost. This has limited its application to vehicles that are low volume/high cost, or where the vehicle manufacturer subsidises it as part of its learning process. Now, Williams has developed 223 and Racetrak technologies that offer comparable performance to existing composites solutions, but with a range of benefits, and at a cost that brings them within reach of mainstream applications. The 223 process was conceived as a cost-effective means of creating 3D composite structures from a 2D form. It is ideal for box-like geometries, such as battery containers for electric vehicles, or potentially even complete vehicle monocoques. The name is derived from one of the process’s defining features: while composite components generally have to be laid up in their final geometry, 223 allows the part to be created initially as a 2D component before being folded into a 3D structure. Thus, it lends itself to a wide array of applications. In particular, 223 suits structures that are currently assembled from many separate components, and where access for fitting-out adds time and cost. For example, an automotive body-in-white, which typically consists of around 300 metal pressings, made with some 600 different tools; a vehicle bonnet may require four different press operations. Using 223, the number of pressings could be reduced to around 50, all created on a single machine with a significant reduction in the capital expenditure for tooling. An estimated weight saving of 25-30% could also be achieved on a car’s body-in-white, compared to an equivalent aluminium alloy structure. With 223, this could be delivered in higher volumes and at a lower cost than a traditional composite solution. Where less strength is required, further cost savings could be made by specifying lower cost materials, for example glass fibres, while alternative resins can be specified to increase toughness and heat resistance. According to Williams, the 223 is a radically different (and therefore confidential) process for the integration of woven, dry fibre reinforcement sheet with a separately-prepared resin matrix. The technique provides freedom to optimise both elements to the specific requirements of a design across the component. For example, a design may employ high-strength carbon fibres as the reinforcement in structurally critical areas, while low cost glass fibres could be used in others. The process begins with an automated cutter trimming the flat sheet of woven fibre into nearnet shape. The excess material from this process is dry, untreated fibre, which is substantially easier and more cost effective to recycle than traditional pre-impregnated materials. At this stage, other components can be easily embedded, such as printed. Next, the matrix is applied using an automated process that allows the composition of the resin to be specified locally across the part, allowing properties such as toughness and thermal conductivity to be varied across the component. At this stage, the preform is still a flat, 2D sheet, like a cardboard box that has yet to be folded. Williams estimates fibre deposition rates of up to 500 kg/hour. Overall, 223 is up to around 50 times faster than traditional aerospace-grade methods, which lay down material at roughly 10 to 20 kg/hour. The preform is then fed into an industrial press, where a carefully-controlled force and temperature is applied. This cures the sections that are destined to form the faces of the box, while leaving the hinge areas between them flexible. Thanks to snap curing resins, the pressing process can be accomplished in around 3 minutes and with a high degree of automation. Energy, cost and time savings are also evident from the ability to maintain the press at a constant temperature, where otherwise the autoclave or press would traditionally go through a temperature cycle, adversely affecting the operational efficiency. This is a further benefit of the process. Once removed from the press, the cured areas have sufficient structural strength for additional manufacturing steps to be performed. 223 has been designed to allow transportation of the product to an external facility in this intermediate ‘flat pack’ form, reducing the cost of logistics. In a defence vehicle application, for example, vehicle bodies could be kept flat in storage, with the correct body for the requirement selected and dispatched quickly and efficiently for assembly in the field. Components can be held in this intermediate ‘flat pack’ form for relatively extended periods (up to 12 months) – currently days, with extended times in development – allowing complex tasks to be performed before the final curing stage is carried out. For instance, on an automotive body-in-white, it could potentially provide scope to fit trim, run electrical/electronic harnesses and install heating ventilation and cooling (HVAC) components with easier, faster access and fewer additional tools. Finally, the part is placed in a jig, where it is folded into its finished 3D form. It then undergoes a final curing stage, which solidifies the hinges and seamlessly joins the edges of the adjacent panels to create a perfect 3D shape. Racetrak is a novel process for creating very high strength structural members that link two or more points, such as automotive wishbones or the link arms of aircraft landing gear. It takes its name from the continuous loop of unidirectional material — in this case carbon fibre — that provides extremely high hoop strength. This localisation of very high embedded strength allows substantial cost reduction which, when combined with high levels of automation, allows an affordable component that is dramatically lighter than traditional alternatives. In the case of a wishbone for an automotive application, the finished part could be around 40% lighter than the equivalent forged aluminium item and up to 60% lighter than steel, making it costcompetitive with a premium aluminium forging; and thus aligning with the automotive industry’s target for weight saving technologies, estimated at EUR5-7/kg. Furthermore, up to 80% of the material can be drawn from recycled sources, helping to solve the growing challenge presented by end-of-life carbon composite components. This placed into an industrial press, where a vacuum is applied, and the resin is injected into the heated mould. Under these conditions, the resin takes approximately 90 seconds to cure. It is then ejected from the machine and a fresh cartridge loaded. With a cycle time currently at just 120 seconds, a single press using this process can produce more than 500,000 units/year. The composition of the system also contributes to an attractive price/ performance ratio as the costliest materials – notably the unidirectional carbon fibre — are used only where their unique mechanical properties are required to deliver high local strength, for example to link anchorage points. The woven shell increases load distribution across the component and enhances both sheer strength and damage tolerance. As with the new 223 process, automation ensures repeatability, removes the need for skilled labour, reduces cycle times and minimises the quantity of premium material that is required for unidirectional lay-up. Each tool costs around one tenth the cost of a steel tool, making smaller production runs more affordable. The same tool can also make similar shaped components of different specifications, simply by changing the composition of the cartridge. 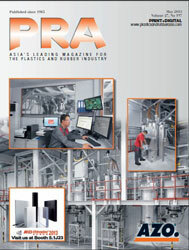 The Racetrak system allows a choice of resins, for example polyurethane (PU) instead of the more conventional epoxy resin, increasing the toughness of the system as well as reducing the cost, with the option to further increase energy absorption by adding ductile materials such as ground end-oflife CFRP. PU resin is also an effective adhesive, allowing in-mould integration of fixings and other components. For increased resistance to high temperatures, a phenolic resin could be specified. With savings in process time, skilled labour, materials and capital investment, Racetrak will allow high strength, light weight composite components to be used in applications where CFRP was previously too costly. Like 223, Racetrak also brings additional benefits, such as ability to embed components such as thin film sensors (which can be just 6 microns thick) and bearings, effectively removing another step from the current production process; and being environmentally attractive because it requires very little energy, and because the bulk material used in the core can be created from the multidirectional carbon created from the 223 and Racetrak manufacturing scrap. It can also use a high proportion of ground material created from end-of-life recyclate, helping to solve the current challenge of how to recover and re-use carbon components from end-of-life vehicles as required by legislation, such as the European End-of-Life Directive. Automotive, including commercial & off-highway vehicles, where weight reduction is a major benefit when using 223 process in the vehicle’s body-inwhite. Williams estimates that a vehicle monocoque produced in carbon composite using the 223 process could be 25% lighter than an aluminium structure. 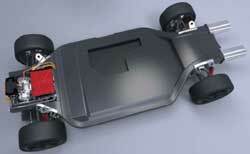 The company has already employed this process in the production of the battery case for its FW-EVX Electric Vehicle Platform concept. Racetrak was also used in FW-EVX to manufacture the suspension wishbones with a weight saving of approximately 40% compared with aluminium and 60% compared with steel. Williams has designed and manufactured composite wishbones for its Formula 1 cars for more than 25 years, giving it considerable experience in this application. 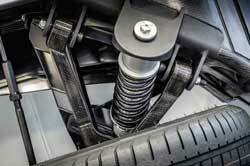 Automated driving: turning wishbones and other CFRP components into calibrated load cells that could transfer road load data back to the vehicle via wireless electronics. This would not only allow a vehicle manufacturer to capture anonymised usage data, it will also have practical applications at a vehicle level, measuring real-time loads applied to a component. An example is a wishbone providing data that can be used to infer lateral grip, for use by the stability control input. Increasing efficiency of heavy-duty and off-highway vehicles translates into revenue from additional payload, and savings from improved fuel economy. Engineers can save weight where it will make the biggest difference in efficiency; for example in reciprocating components like stacker forks, or where it compromises stability such as high on crane masts.